Since we hadn’t driven anywhere lately, we took off this weekend up to Fayetteville, NC to visit our daughter and her husband. If you’d have asked me the best way to get from Atlanta to Fayetteville, I never would have guessed that you would take I-20 east until it ends and drive briefly north, but that was the path that the GPS laid out. We left home around 1:00 pm and I was getting pretty hungry by the time we hit the South Carolina line (in spite of the biscuit we ate before we got on the highway). 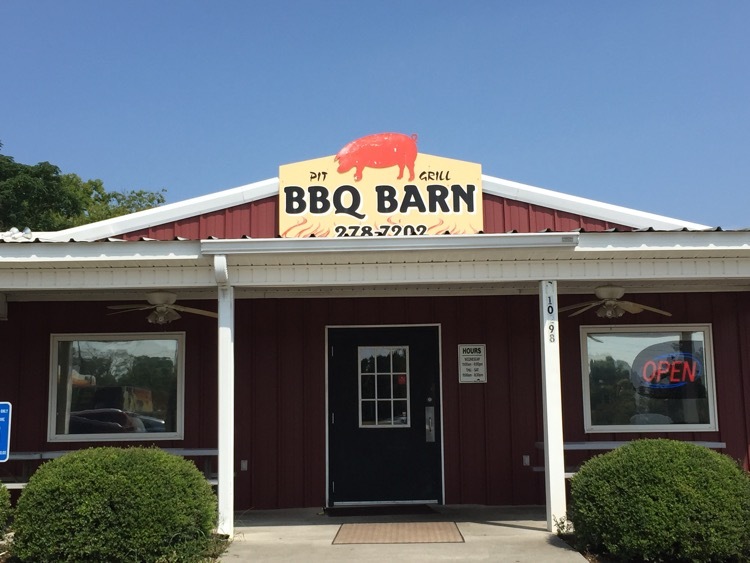 One of the places recommended to me, several years ago by a business cohort from Augusta (when we were heading to Myrtle Beach) was the Barbecue Barn in North Augusta, SC. We had planned to stop there a couple of times over the years, but never seemed to be in that area around meal time. As we pulled up in the gravel parking lot, one of the first things I was struck by was the phone number on the building. In Atlanta, we’ve had ten digit dialing for so long that whenever I see a seven digit number I immediately think of something as “missing”. Note the meat choices on the menu – BBQ, pork loin, chicken breast, ribs and (on the piece of paper on the bottom of the menu) brisket. 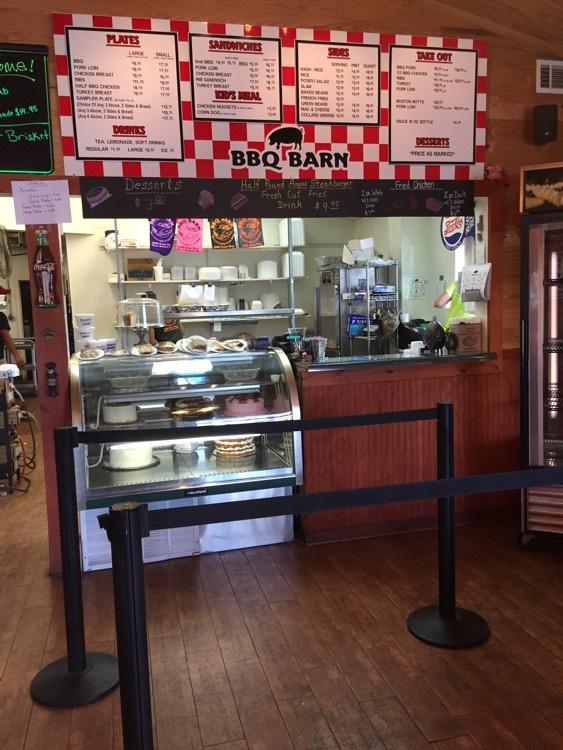 This simple menu board clarifies an essential truth about barbecue in the South – “Barbecue” is pork. Don’t get me wrong, I love brisket as much as, if not more than, the next guy, but you “barbecue” a brisket. “Barbecue”, as a noun, equals pork, as the Good Lord intended. It’s in print on that sign – therefore it must be true. We planned to share a meal, as we thought we’d be having dinner when we arrived in Fayetteville. We chose to share a combo, initially shooting for brisket and pork, but as the brisket was new to the menu, they didn’t know how much they would sell in a day and they were sold out. 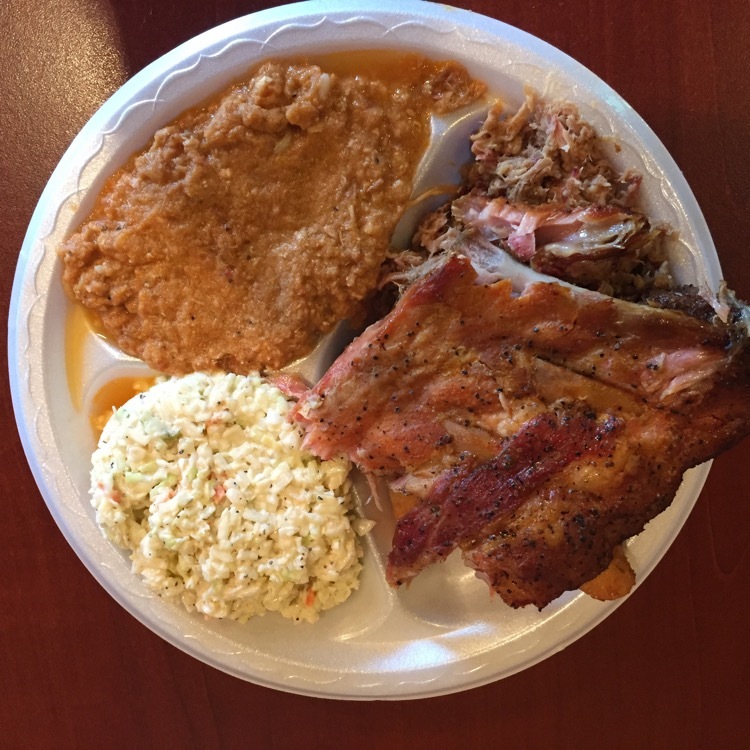 We settled instead on pork and ribs and each chose one side – slaw for my bride and hash for me. While we waited for the food, I was checking out the sauce choices. 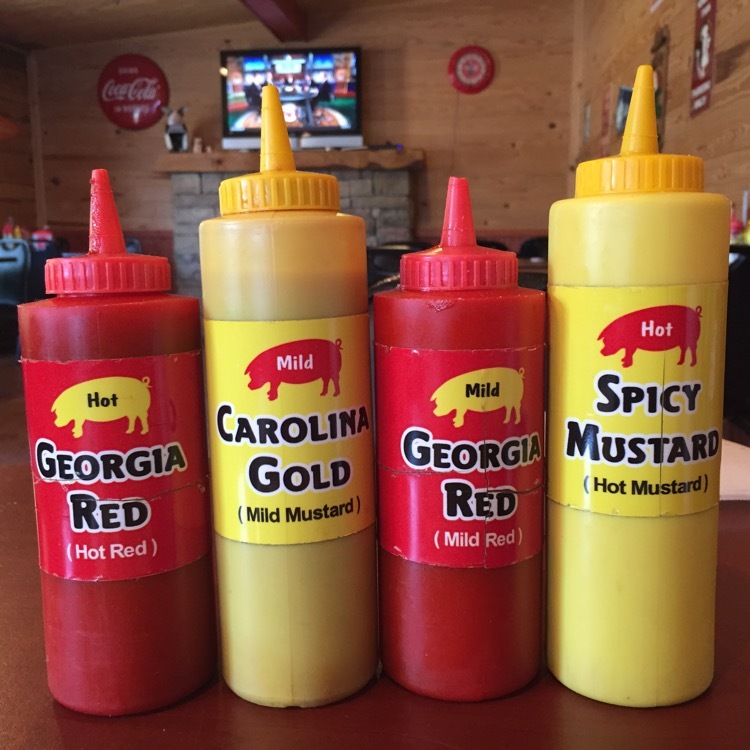 I expected that they would have a SC-style barbecue sauce (it was good) and they also accommodated the proximity to the Georgia border with the spicy and mild tomato-based sauces (they were both okay). The shocker on this table was the spicy mustard sauce. I don’t know that I’ve ever had a spicy SC-style mustard sauce and this was very good. In fact, as we were getting in the car, my beloved said that this was her favorite barbecue sauce, ever. One of the things that I look forward to in SC is the hash served with the ‘cue. This was the first has that I’ve had in a couple of years and it was fine. Adding that spicy mustard sauce to it made it much more than that. The meats were smoked well and were well complemented by the sauce. I heard that the slaw was okay. That spicy sauce was the standout of the meal. One of the other oddities, to me, were the irregularly shaped hush puppies (you can’t see them in the picture – they’re under the ribs). This is another feature unique to Carolina barbecue – we don’t typically see hush puppies served with barbecue at home. As we were ordering our meal, I noticed the fresh cakes (on styrofoam plates, wrapped in plastic) by the register, but refrained. But as we were walking out the door, my will power caved and went back for a piece of the key lime cake. 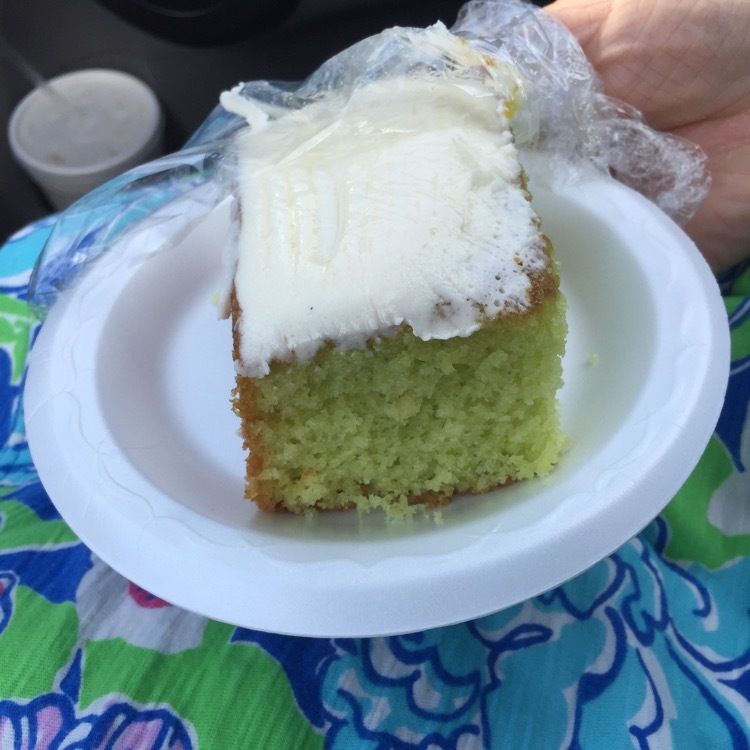 I don’t know if you’ve ever had key lime cake, but it’s been on my mind since I heard a story on NPR several weeks ago on the Splendid Table. Key lime cake has the key lime flavoring in the cake itself and a sour cream frosting. Jo then signaled from the door for me to grab her a slice of the peanut butter-caramel cake. We each ate our slices as we drove. Not a bad way to travel through South Carolina.